Frazer has the ability to import your vehicles from select 3rd party vendors. 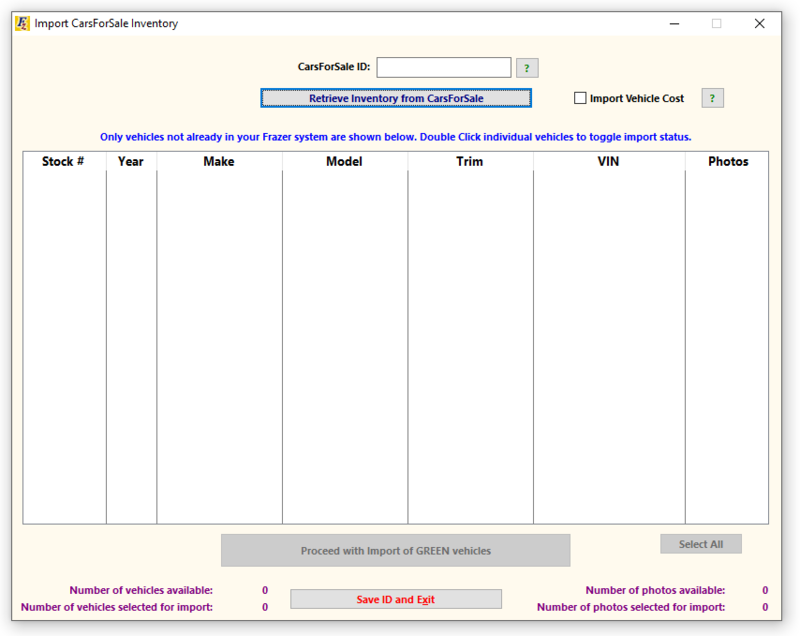 This process allows you to fill your Frazer inventory with your vehicles without having to hand-enter each one. If you market with any of the five companies listed below and want to import your vehicles from them into Frazer, continue reading! *You will need to contact the vendor to ready your inventory before you can do any importing into Frazer. **Also, you need to be aware that Vehicles get imported by Stock Number. This is especially important if the list of stock numbers in your vendor's website is the same as the one in Frazer, but the vehicle VINs are different. You will end up importing nothing, even though you need those vehicles. If you run into this, the only fix is to change the stock numbers in either Frazer, or with your Vendor. *** Lastly, this is not an automated process. Whenever you update your inventory through your vendor, you will have to run the Import process in Frazer again to get any new vehicles. 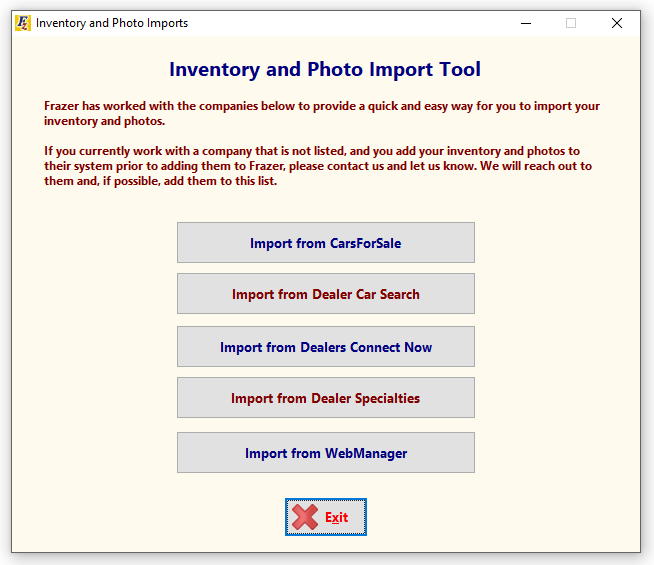 First, you will need to access the Inventory and Photo Imports tool in Frazer. Click the Vehicles drop down, and then select letter A. Import Vehicles. Click on any of the companies listed there, to select it for Import. For this tutorial, we'll be using the CarsForSale Import. We would have already contacted CarsForSale, in this case, to have them ready our inventory for Import. We entered our CarsForSale ID into the ID field and clicked Retrieve Inventory from CarsForSale. Once again, the list above includes any vehicle Stock Numbers that aren't already in Frazer. with the same stock numbers as the vehicles you are trying to import. 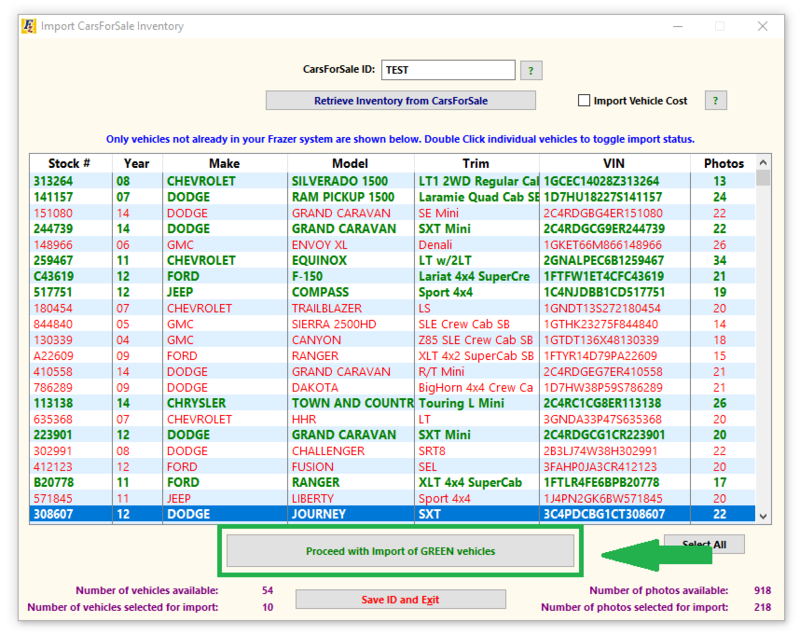 Verify the info, and change the stock numbers of any vehicles you need imported. Vehicles listed in Red will not be imported. Vehicles listed in Green will be imported. 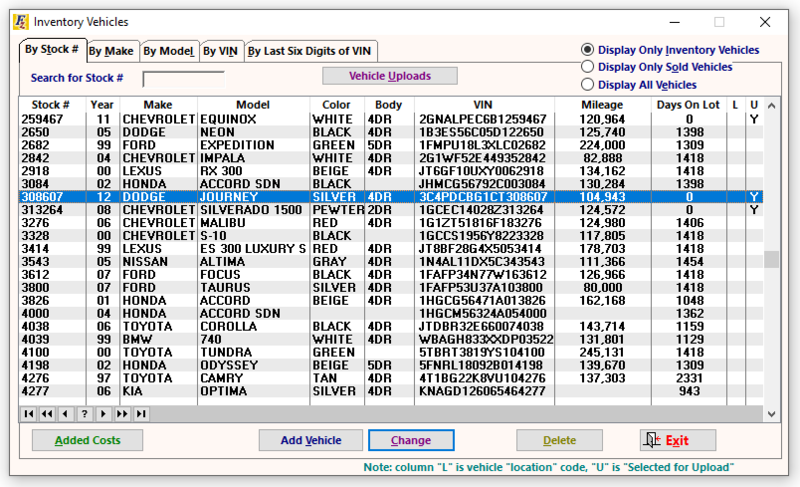 To select a vehicle for Import, simply double-click it. This will switch it from Red to Green. Alternately, you can just click Select All in the bottom right to select everything in the list. When you have every vehicle you need selected, click Proceed with Import of Green Vehicles. 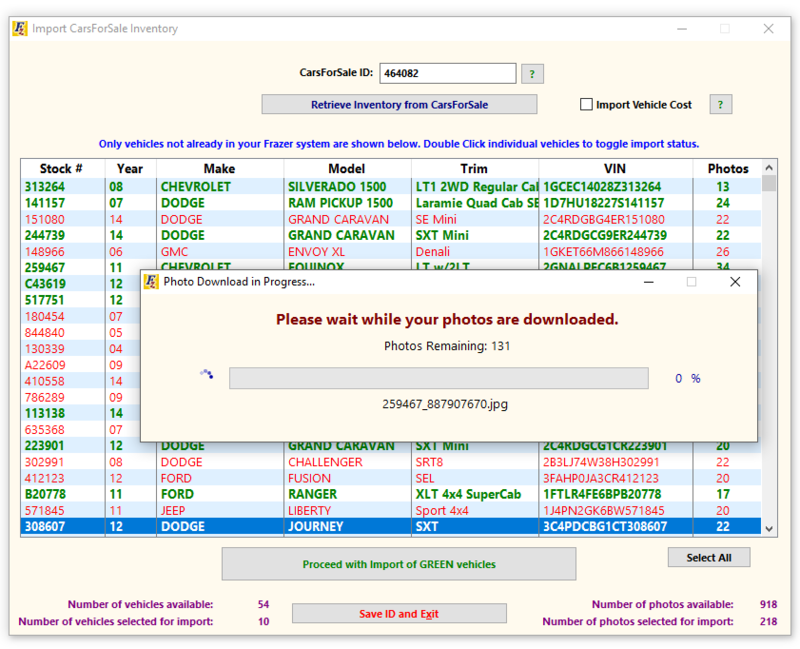 Your vehicles and their photos will now be imported into Frazer. Once the import is complete, you'll be able to view the new vehicles in your Frazer inventory. Imported Vehicles work and look the exact same as if you had entered them manually. You must contact CarsForSale prior to importing. You may import your inventory every morning after 5am EST. 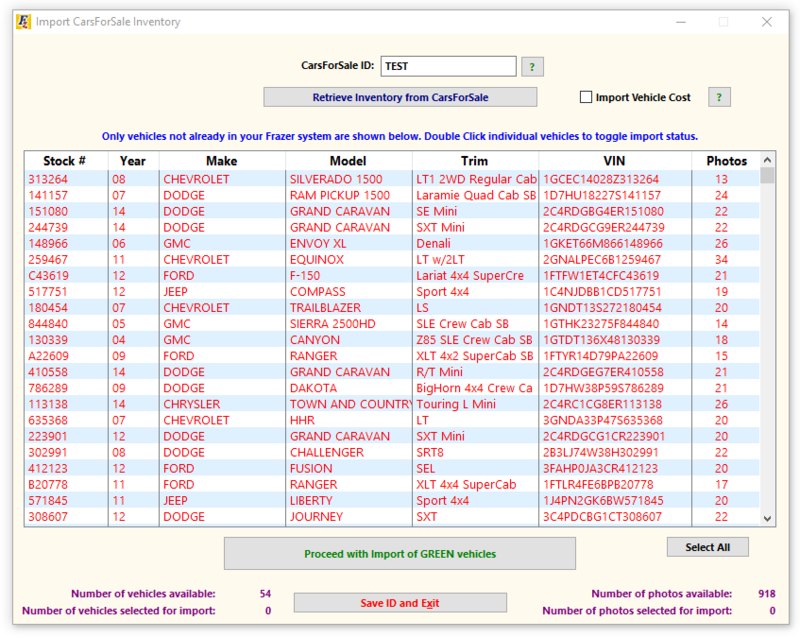 You must contact DealerCarSearch prior to importing. Dealers Connect Now - Requires your Dealers Connect Now Username and Password. These are the email address and password you use to login to the Dealers Connect Now website. You may import from Dealers Connect Now whenever you'd like. Dealer Specialties - Requires you Dealer Specialties ID. You must contact Dealer Specialties prior to importing. This can be done in the Inventory Feed Settings section under Settings > Website > Inventory Integration. You may need to enable the XML Feed Feature before you'll see the option to generate the URL. Feel free to call Frazer if you're having trouble setting up the Webmanager Import. If you need further assistance Importing your vehicles from any of the vendors listed above, call Frazer at 888-963-5369.